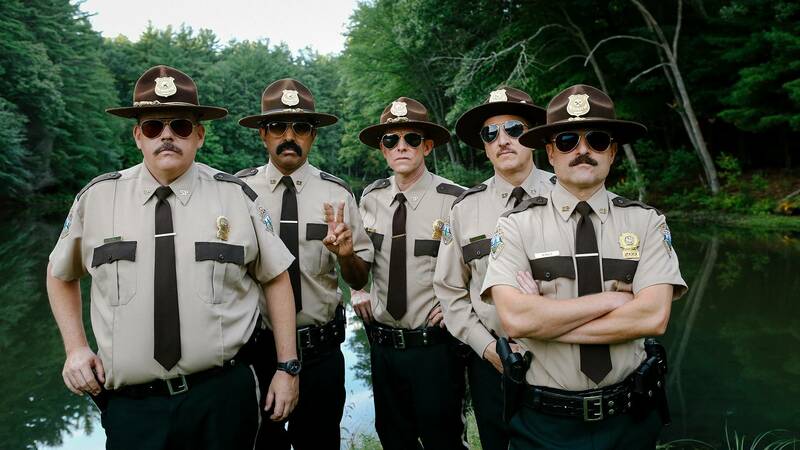 The gang's back together for "Super Troopers 2." In Amarillo theaters this week: A high time with some Troopers and Amy Schumer, plus Karate Kid and an anime classic. And, on the horizon: Avengers. This Indian/Telugu political thriller, starring Mahesh Babu and Kiara Advani, gets a handful of screenings Thursday and Friday at Hollywood 16. Studio Ghibli Fest 2018 continues with this fantasy adventure about a schoolgirl and her extremely unusual pet cat. It'll screen (dubbed in English) at 12:55 p.m. Sunday and 7 p.m. Wednesday, and at 7 p.m. Monday (subtitled) at both the Amarillo Star 14 and Hollywood 16. This faith-based special, featuring Craig Evans' attempts to prove historical foundations behind the New Testament, will screen at 7 p.m. Tuesday at both Amarillo Star 14 and Hollywood 16. Reboot fever strikes again: YouTube Red will bring back Karate Kid's Daniel (Ralph Macchio) and Johnny (William Zabka) to revisit their rivalry 34 years later in a new series premiering May 2. Fans can get a preview of the first two episodes plus a screening of the original 1984 film in this special event at 7 p.m. Wednesday at both Amarillo Star 14 and Hollywood 16. April 26: Advance tickets are on sale for superhero smorgasbord Avengers: Infinity War at both Amarillo Star 14 and Hollywood 16. April 28: The Met: Live in HD continues with the company's first production of Massenet's Cendrillon, a Cinderella story starring Joyce DiDonato, Alice Coote and Kathleen Kim. It'll screen at 11:55 a.m. at the Hollywood 16. April 29 to May 2: The fantasy classic Labyrinth, starring the late David Bowie as the Goblin King, will screen in a three-day celebration at 2 and 7 p.m. April 29 and 7 p.m. May 1 and 2 at Amarillo Star 14. May 1 and 3: The faith-based family drama Like Arrows will screen at 7 p.m. May 1 and 3 at both Amarillo Star 14 and Hollywood 16. May 3: Anna Faris and Eugenio Debrez star in the gender-swapped remake of Overboard; advance tickets are on sale now at Hollywood 16, with Amarillo Star 14 expected to follow. May 4: The thriller Bad Samaritan, starring David Tennant and Kerry Condon, and drama Tully, from the creators and stars of Juno and Young Adult, are expected to open nationally, but advance tickets are not yet on sale. Release dates are subject to change. May 8: The children's animated film The Boxcar Children — Surprise Island will screen at 4 p.m. at both Amarillo Star 14 and Hollywood 16. May 9 and 12: The musical Puffs: Filmed Live Off Broadway, a parody of the Harry Potter series told from the perspective of different students, will screen at 7 p.m. May 9 and 12:55 p.m. May 12 at both Amarillo Star 14 and Hollywood 16. May 10: The anime film Digimon Adventure Tri. : Coexistence will hit big screens for showings at 7:30 p.m. May 10 at both Amarillo Star 14 and Hollywood 16. May 11: Advance tickets are on sale for home-invasion thriller Breaking In, starring Gabrielle Union, at Hollywood 16; Amarillo Star 14 should follow. College romp Life of the Party, starring Melissa McCarthy, also is scheduled to open nationally, but advance tickets are not yet on sale. May 13 and 16: The TCM Big Screen Classics series continues with Sunset Boulevard, screening at 2 and 7 p.m. May 13 and 16 at both Amarillo Star 14 and Hollywood 16. May 15: Singer Michael Bolton hosts American Dream: Detroit, a look back at the city's history and an optimistic examination of its future. It'll screen at 7 p.m. May 15 at Hollywood 16. May 17: A National Theatre Live screening of Macbeth, starring Rory Kinnear and Anne-Marie Duff, will screen at 7 p.m. May 17 at Amarillo Star 14. May 18: Advance tickets are on sale for comic book sequel Deadpool 2 at Hollywood 16; Amarillo Star 14 should follow. Adult dramedy Book Club, starring Diane Keaton and Jane Fonda, and children's comedy Show Dogs are scheduled to open nationally, but advance tickets are not yet on sale. May 20 to 23: The Studio Ghibli Fest 2018 continues Porco Rosso at both the Amarillo Star 14 and Hollywood 16. An English-dubbed version will screen at 12:55 p.m. May 20 and 7 p.m. May 23, with a subtitled version screening at 7 p.m. May 21. May 22: The inspirational documentary Godspeed — The Race Across America charts an attempt by racers Jerry Schemmel and Brad Cooper to make it across America on bicycles. It'll screen at 7 p.m. May 22 at Amarillo Star 14. May 25: The embattled sci-fi prequel Solo: A Star Wars Story, starring Alden Ehrenreich and Donald Glover, is scheduled to open nationally, but advance tickets are not yet on sale. Click on titles for my reviews and on theaters for showtimes. Bharat Ane Nenu (H-16); Black Panther (H-16); Blockers (AS-14, H-16); Chappaquiddick (Premiere Cinemas Westgate Mall 16, 7701 W. Interstate 40); Ferdinand (WM-6); I Can Only Imagine (AS-14, H-16); I Feel Pretty (AS-14, H-16); Isle of Dogs (AS-14, H-16); Jumanji: Welcome to the Jungle (WM-6); The Leisure Seeker (WM-6); Midnight Sun (WM-6); The Miracle Season (AS-14, H-16); Pacific Rim Uprising (WM-6); Paul, Apostle of Christ (AS-14); Peter Rabbit (WM-6); A Quiet Place (AS-14, H-16); Rampage (AS-14, H-16 and Tascosa Drive-In, 1999 Dumas Drive); Ready Player One (AS-14, H-16 and TDI); Sgt. Stubby: An American Hero (H-16); Sherlock Gnomes (H-16); Super Troopers 2 (AS-14, H-16); Tomb Raider (WM-6); Traffik (H-16); Truth or Dare (AS-14, H-16); and Tyler Perry's Acrimony (AS-14, H-16).